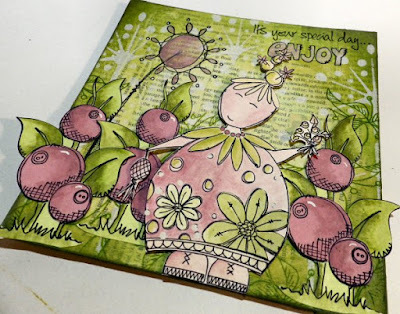 Stamping Sue Style: PaperArtsy JOFY new releases ! The first sample is especially for little boys, and the main image that Jo has created is just perfect ! I started by making a masterboard, the splats are just fabulous for this technique. The panel behind the boy is painted with Taupe Fresco Finish then stamped with the tyre tread stamp frpm JOFY44 using Dusty Teal Fresco Finish. The boy and car have both been painted with Teresa Green and Granny Smith with a little Dusty Teal Fresco Finish and then cut out. 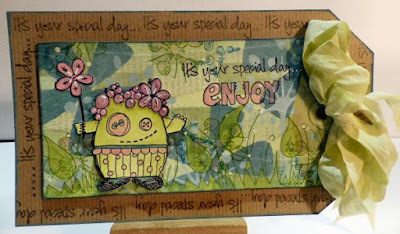 The text has been stamped onto Smoothy card that's been painted with Taupe. The small flowers on this stamp set are fabulous for cutting out and layering and I love the little girl ! I've used a piece of grey/white board as the base for this project and covered it with pieces of dictionary paper. I've then stencilled the background using Snowflake Fresco Finish and the JOFY 007 stencil. I used the lovely tri leaf stamp from the new JOFY42 and stamped it around the bottom edge. I've stamped the circular flowers onto Smoothy card painted with Teresa Green Fresco Finish then added some shading using Granny Smith Fresco Finish. The flower heads were stamped onto card painted with Rose Fresco Finish then shaded with Rose mixed with a little Slate, then cut out and stuck on to the leaves. The little girl was stamped onto Smoothy card painted with a mixture of Snowflake and Rose Fresco Finish. I've added some shading and stamped the flowers from the image again, painted and layered them up. For the last sample I wanted to use the little cute guy from JOFY42 and he fits just perfectly onto a landscape tag! I glued some book paper onto the tag then stencilled the large flowers from JOFY's new stencil using Dusty Teal Fresco Finish. I added some more stencilling using the JOFY 007 stencil then did some stamping. 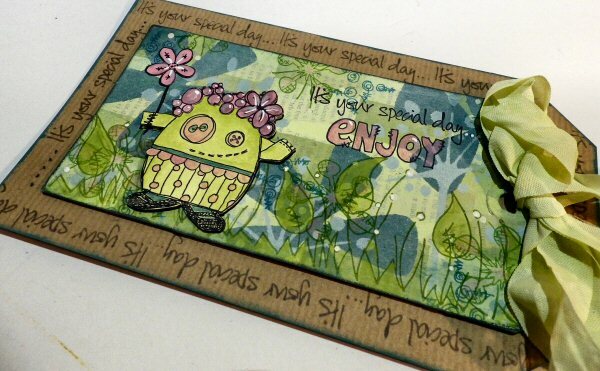 The cute little guy was stamped onto Smoothy card and painted then cut out. I stamped the flowers on the head again onto Smoothy card painted with Rose Fresco Finish and cut htem out. I've added some highlights with a Sharpie pen. The sentiment from JOFY 41 was stamped onto the tag and I've painted the word 'enjoy' with some watered down Rose Fresco Finish. 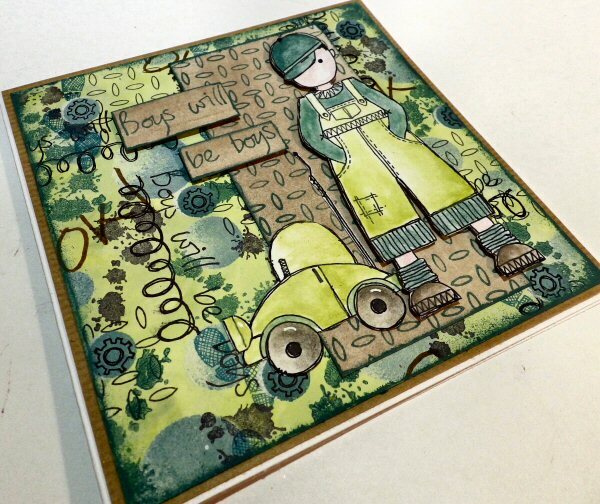 That is mounted onto Kraft card taht I've stamped using part of the same text stamp with Watering Can Archival ink. The ribbons is seam binding that I've coloured using watered down Teresa Green Fresco Finish. 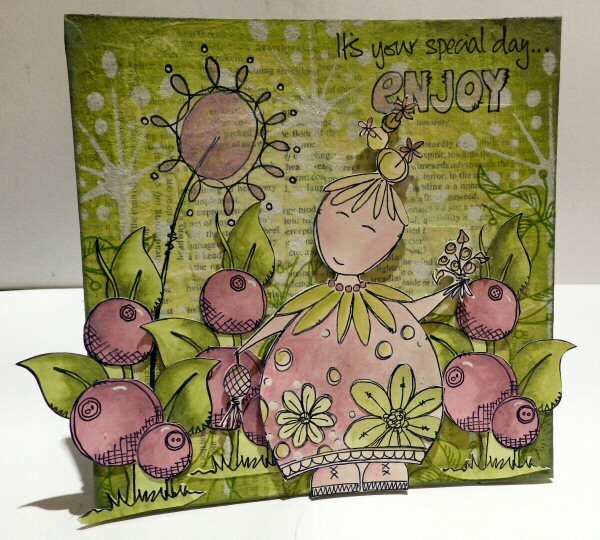 There are lots more samples to see on the PaperArtsy blog so do make sure you hop over there to check them out, and remember there will be more to see every night this week on the PaperArtsy blog ! Wonderful samples Sue! You've really done these gorgeous new stamps proud and I am in love with this little boy. He reminds me of my grandson Charlie! Sue, these are such beautiful samples!! 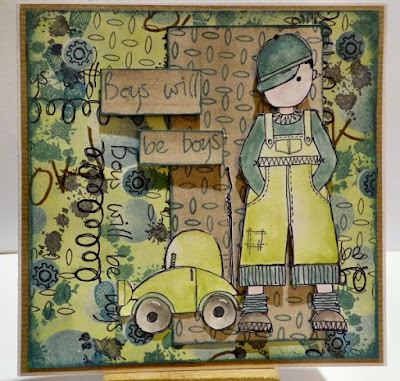 I already adore all of Jo's new stamps, and especially how you've used them.. what a week it's going to be. Wow, these look fabulous stamps to use. Your pieces are inspirational Sue. These are so unique Sue - and sooooo adorably lovely. The colors are so intriguing and each one of these stamps is darling. YOU DID THEM UP PROUD - for sure. Wow. Each one of these is it's own masterpiece. WONDERFUL treat. j.